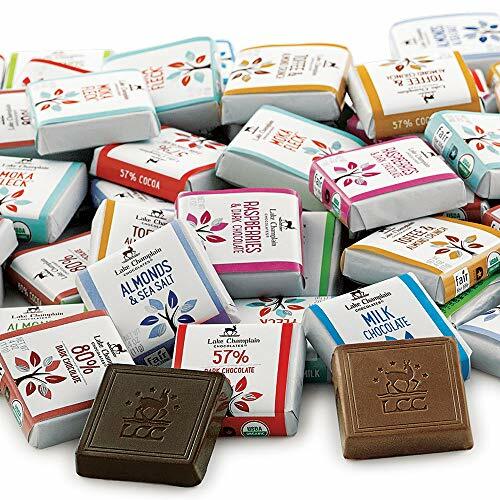 Discover organic chocolate like no other! The purest organic ingredients crafted into tantalizing taste sensations. USDA Organic Certified. These gourmet chocolate squares make perfect wedding, shower, or party favors. Flavors include: Dark Spicy Aztec - 55% cocoa content with cayenne, pumpkin seeds, and cinnamon; Milk Sea Salt and Almonds - 38% cocoa content with a salty-sweet combination; Organic Dark Chocolate - 57% cocoa content; Organic Milk Chocolate - 38% cocoa content. Approximately 175 assorted organic chocolate squares. 4.5 lbs. Kosher.